There are luxury yachts – you know, dime a dozen along Sentosa Cove – and then there’s the Royal Albatross. You spot her a mile away – four masts that are nine storeys high, lots of impressive-looking ropes, ratings (that’s ladders in sail-speak) which lead to precious crow’s nests, and 22 sails (which, when you board the ship, are not yet unfurled). It’s like a scene from Pirates of the Caribbean, except that the ship’s a lot less grimy, and the waiters are a lot more presentable than Jack Sparrow. Okay fine, the Royal Albatross, the only tall ship (that’s a traditionally-rigged vessel for you) in Asia, is downright lavish, with pristine decks, spotless sails and two bars (one on the upper deck and one below) from which a bevy of wait staff dole out glasses of bubbly cocktails. 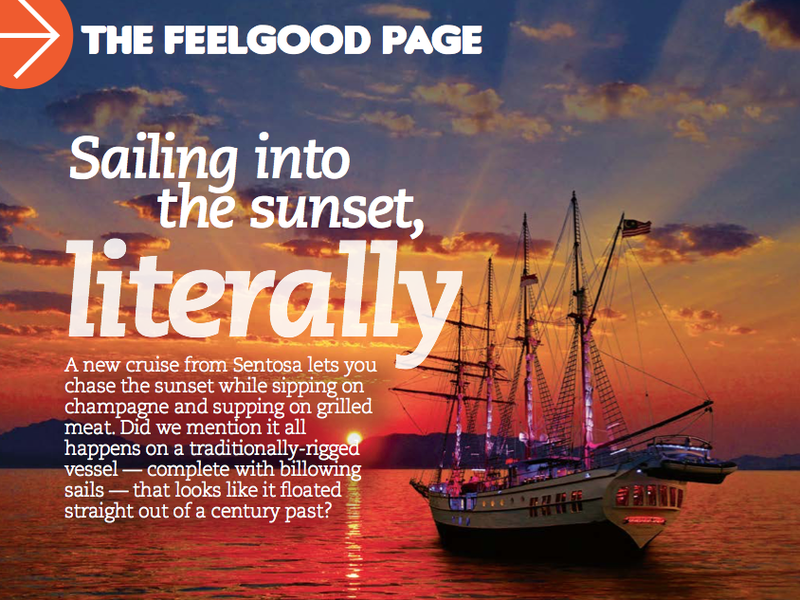 We’re on the maiden sunset dinner cruise on board this fine vessel, one of the few tall ships in private ownership, so her owner, Pete Pela, tell us. The rest of the 150 or so tall ships in existence in the world are mostly used by naives and trusts to teach seamanship and sailing, and build character. Previously only available for private charter (which means companies or individuals have to book the whole ship), the Royal Albatross has just launched a new two-and-a-half-hour cruise open to the public, where lovebird couples and groups of pals can buy tickets at $195 each, for a unique sea-faring experience that’s cooler than your average boat charter. The cruise starts at 6pm, at the ship’s berth along the promenade adjacent to Adventure Cove Waterpark at Resorts World Sentosa, and chases the sunset along Sentosa and the Southern Islands. Needless to say, the views are spectacular. We picked a spot high up at the back of the ship (“the best spot”, so one of the staff tell us) and with the wind in our hair and the sun setting on the horizon, felt like one of those couples sailing off into the sunset of a happy ending in a movie (actually, this very ship was featured as Bruce Wayne’s private yacht in The Dark Knight). After the sun goes down, the only things left to do are eat, drink and make merry, and wait for the Singapore skyline to roll into the view near the end of the cruise. Dinner is served, by you – it’s a sumptuous BBQ buffet – although someone else will do the grilling. If you fancy the sea breeze and the strains of live saxophone music, bring your grub to the deck, where fancy LED lights (mostly pink) illuminate everything (it kinda feels like a hotel lounge). Otherwise, an air-conditioned bottom deck has proper dining tables – just watch out for things sliding off when the boat hits a wave. It’s all mostly quite gentle, though. We don’t see all 22 sails in full glory (whether the ship deploys the sails or uses its modern motor depends on the strength and direction of the wind), but the handful of sailors are kept busy unfurling sails, tying knots and climbing up and down the masts. It all made for a unique, romantic experience, and many marriage proposals will no doubt be made on this deck at sunset. We’re sure the sax will help. Freshly-grilled on board: This is the first time we’ve seen a BBQ pit hanging off the side of a ship. Awesome! Keeping cool below: The posh interiors of the air-conditioned lower deck, where you can get respite from the sun and sea breeze. The sunset Sail takes place every Friday to Sunday. Prices are $195 for adults and $145 for children 12 and below, and include a BBQ spread and welcome drink. Schedules and bookings available at www.tallship.com.sg/products and via RWS and selected travel agents.